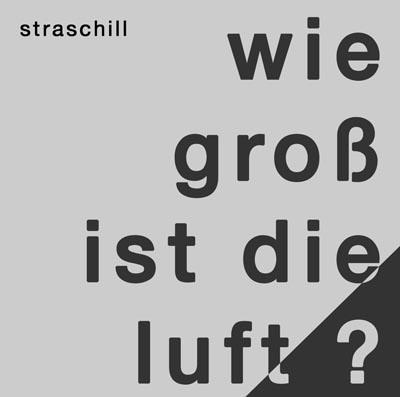 Moinlabs: Wie groß ist die Luft? The MoinSound 2008 World Tour - Straschill's most ambitious and biggest tour so far. Wie groß ist die Luft ? is a documentation of that tour, or more specifically of Straschill's trombone-oriented performances in it. The album features tracks from the concerts at BEMF3 and the Berlin Live Looping Festival, and sees the performer alone with his signature "komische Elektronik" (whimsical electronics), as well as with featured artists Motoko Honda (grand piano, electronics), Krispen Hartung (nylon-string acoustic guitar) and TJ Shredder (even more whimsical electronics). Trombone + komische Elektronik = ? The choice of the trombone as the "center of attention" may come as a surprise, as Straschill's recent releases have all been more or less built around a combination of pulsing drum beats, throbbing bass lines and screaming guitars battling synthesizers. However, for quite some time Straschill used to play the trombone as his main instrument, even surpassing keyboards. According to Straschill, the choice to revive his trombone skills came after receiving an invitation to headline the prestigious BEMF3 festival. "Actually, I had for some years thought about picking up the trombone again, but it didn't seem to fit in properly with what I was doing at the time. Now that BEMF festival focusses on experimental, avantgarde and out-of-the-ordinary music. So I thought to myself: what could be more out of the ordinary than a trombone in combination with really heavy electronic processing?" 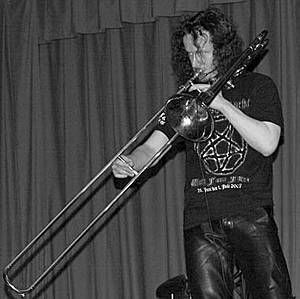 With a refined setup of his "komische Elektronik" computer-based processing environment, Straschill used the trombone and the occasional vocal noises as the only sound sources on the majority of gigs on that tour. But what is it like? First, it's safe to say that it sounds different from what you'd expect. A combination of lyrical trombone playing and moutpiece noises, all that together with vocal outings ranging from soft sensual whispers to furious screaming, are combined and reshaped by an array of looping delays, cascaded pitch shifters and filters. "As I had prepared the setup and also started playing trombone again a mere weeks before the tour started, a lot of surprises happened - surprising not only the audience, but also me as...things happened", Straschill remembers. Wie groß ist die Luft? can be seen as a collection of the most intriguing surprises from this tour. This album has been mastered with the goal of a lot of macro- and microdynamics. What does that mean? Microdynamics is the level difference between the average loudness during one specific passage of the music and the spikes (like, say, a drum hit). On the contrary, macrodynamics describes the difference in average loudness between a very quiet and a very loud passage of a song or over an album. On "Wie groß ist die Luft ? ", there's a microdynamic ratio of 5:1 and a macrodynamic ratio of about 16:1. This last value means that the loud passages are in fact sixteen times as loud as the quiet ones, and that even in those loud passages, there are short spikes which are five times as high as the average. This is relevant insofar, as today's listeners are usually treated to music which has far smaller values for both of that. On a typical contemporary pop album, the microdynamic ratio is slightly below the 3:1 range, with a macrodynamic ratio of 2:1 (that means the loud passages are only twice as loud as the really soft ones). In fact, the values on "Wie groß ist die Luft ?" even exceed those from other Straschill albums (e.g. Weird Specialist) by a big factor. Listen attentively on a high-quality stereo system in a proper (quiet) listening environment. Cleaning the dishes while listening to this album playing on a cheap radio in the other room is not a good idea. Turn it up! You can do the math yourself: the really quiet passages on this album will be thirteen times softer than those on a typical contemporary pop album you might've listened to before. Sudden jumps in loudness can be startling. In other words: don't handle things which can get damaged or damage you or others while listening to this music. Avantgarde guitarist/sound designer Daryl Shawn described it on loopers-delight.com as "It's a corker". And here's his full review. Quote: "This is a terrific work". The audio for the pieces from the Berlin Live Looping Festival was recorded by Rick Walker. The audio for Asoziale Netzwerke was recorded by Aaron Davis. The photo of Rainer Straschill's appearance at BEMF3 displayed on this page was taken by corkscrew photography/Thee Art Of. Rainer Straschill's appearance at BEMF3 was made possible by a generous grant from Goethe-Institut.